You need to provide a steady stream of entertaining, educational and relevant content for your business social media channels, but you are completely out of fresh ideas on where to source that content. Fear not. Just read on, and we will give you some great sources which will become your daily check-in, and stop that everlasting hunt for good content. There’s a lot to be said for the humble Twitter list. It’s probably one of the most underused features of the platform, but it’s great for corralling some good content sources together in one place. They can be time-consuming to set up since you need to search for relevant influencers in your chosen area, but once set up you can just check through the list(s) quickly to see if there’s anything you can use. Much better than trawling through your whole Twitter feed, and you can set up different lists for different topics. 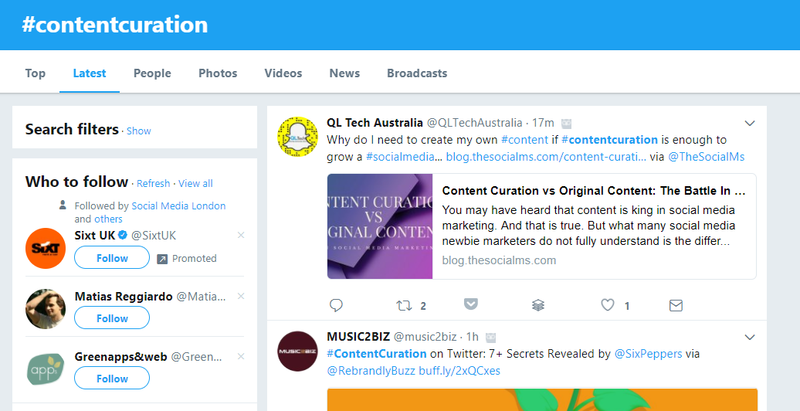 Right Relevance is a free tool which helps to find relevant content via keyword search, or through your Twitter followers if you connect your Twitter account. It’s worth doing that because if you find content you like, you can post it directly to Twitter with just a couple of clicks, or schedule it in to your Buffer account. It can also analyse your influence on Twitter and give you recommendations on who else to follow, and who are the important influencers in particular topic areas. Flipboard started as a newsreading app and grew into a website. The founders wanted to build an app that would cure what they call ‘the information overload problem’. I think we can all relate to that! It became a kind of personalised magazine, and was perfect for the birth of the iPad. It was navigated by ‘flipping’ the pages so it felt like a magazine, but one made especially to interest you. Since you can make your own collection, or ‘magazine’, it can feel like a cross between Pinterest and an RSS feed but because the algorithm works around your interests, most of what appears on your feed should interest you. Newsify is much more than just an RSS feed option for your mobile device. You can receive notifications for new articles, you can read offline (with images cached) once you’ve opened an article in the app, you can make your own library and sync it to iCloud. And it’s free. 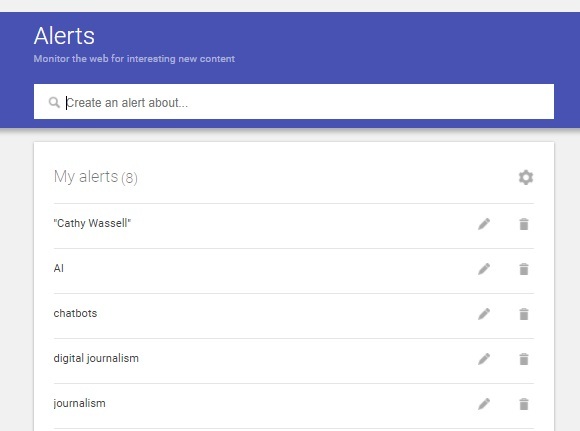 Google Alerts allow you to set up a tracking system for chosen keywords where you are notified if any article is published about those keywords. 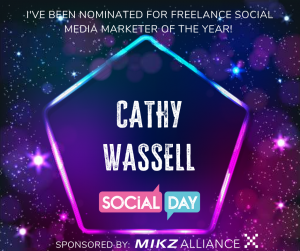 It couldn’t be easier, and takes less than a minute to set up but can keep you up to date and also allows you to practise ‘social listening’ to monitor any mentions of your business, your industry or your competitors. 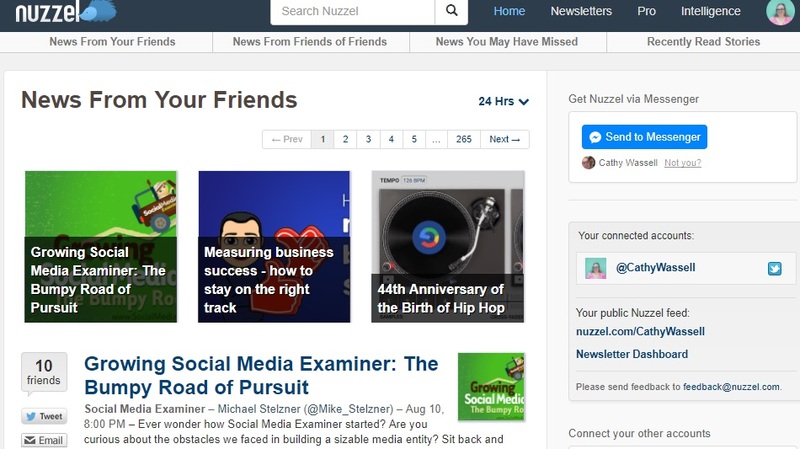 Nuzzel is a free news app which creates a news feed based on what your connections are talking about on social media. The result is a feed which feels much closer to your interests than anything else you will find. It works because it doesn’t contain only news items which contain keywords you picked when you joined; it is an organic feed which changes according to your friends’ tastes. Scoop.it is a content curation site using keywords, which can be used merely to find content for you to post or to curate ‘collections’ of content which you may want to share as one piece. There is a free element but fully featured it is a paid plan. It might seem obvious, but are you doing it? When we polled the #DMCollective, a private group of 750+ trained social media managers, about their favourite content curation tools a hashtag search came near the top of the list. It’s quick, it’s free and it turns up content from places you might not have thought to look. Don’t discount it. Anders Pink may qualify as one of the new guys on the block in terms of content curation tools, but it already has its fans. It’s similar to Feedly, but the layout is clean and cohesive and the free plan allows an impressive amount of content to be found. 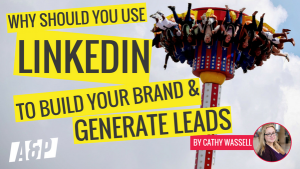 It can also curate top performing content from your own network. 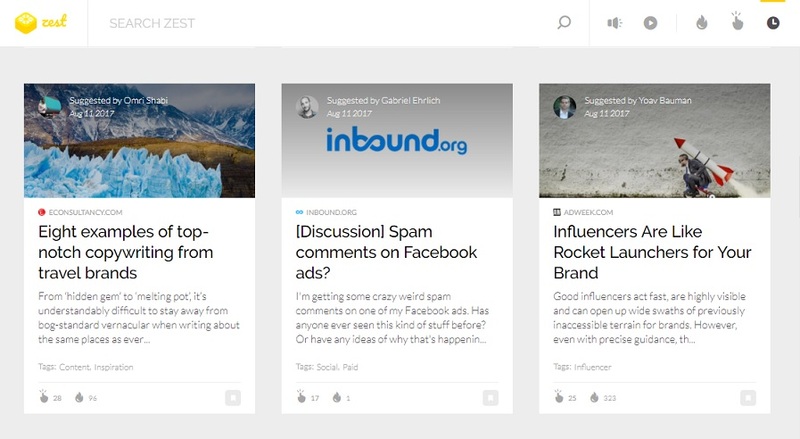 Paper.li collates other people’s content and publishes it in an online newspaper. If your content is featured you will get a Twitter notification. You can collect the kind of content you choose and share it with your social networks or creating an online newspaper or email newsletter. Zest is recently launched and already getting rave reviews. It curates content of high quality that has been verified by pros who approve 1% of the suggested content manually. That really adds value and integrity to this free tool. You can add Zest to Chrome, which will show you new trending content as soon as you click on the tab – very useful! The feed can also be personalised, and you can even suggest your own content to be added (if it’s good enough!). BuzzSumo is a popular paid tool which allows you to identify influencers as well as find content. It is filled with features such as keyword search and filters for specific content like infographics and videos. You can also follow trending topics and get the RSS feeds for these. 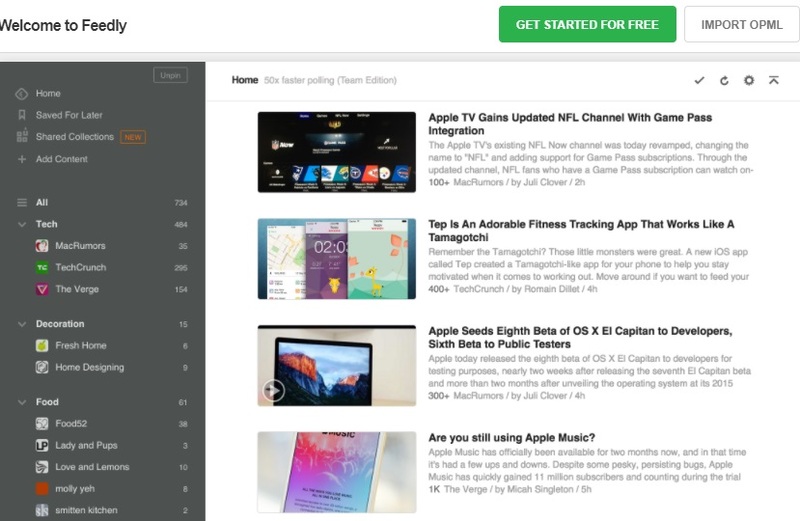 Feedly is nice and simple, integrates well and you can send content direct to Buffer. As with most of the other tools, you can add to your ‘read later’ section when you don’t have time to spare. There are both free and paid versions. Although Pocket‘s main function is as a virtual notebook to keep content for later, the Explore function also works as a free content curation tool for specific topics you have chosen. Only high quality content is there so filtering has already been done for you, but it may not all be new content. Content Gems allows you to set filters, and then scans multiple sources to find quality up-to-the-minute content. It has very useful integration possibilities, such as sharing directly on social media and plugging into WordPress and email newsletters. Find your favourite among this bunch and start to populate your social media channels with ease! 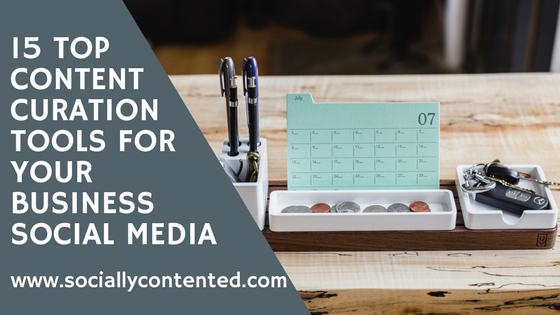 If you’d like to learn more about good kinds of content to post, have a read here, and to check if your content is being looked at, check out this blog. And we’d love to hear what your experiences are with some of these tools. Drop us a line!